In this ground breaking, Sward winning SEO course that has been taken by over 10,000 students. In it we will walk you through how to think like a search engine while keeping top of mind your users. This course bundle includes 6 modules each targeted in the steps involved in creating and tweaking your web site no users to site that is easily consumed by search engines. This is part one of our SEO for content creators bundle. In this part we will get to know the actual web site we will be working on promoting. This is our foray to SEO where we will lay the foundation blocks that will be used through all the modules. There has been a lot of research on reading and it's known that users just don't really enjoy reading online. The glair of the screen and the small fonts just make it hard to read. Imagine you need to read an article but there is a flash light headed right on your face? Fair enough you don't need to imagine as that's probably what you are doing right now. It's true, you could read but its just not as fun as picking up a Kindle Paper white or old school book. On the other hand search engines depend on copy and a lot of it. The more copy you have the more the search engine can understand what your page is about and how much "value" it has to give users. While search engines are hungry for copy users tend to be happier with shorter and to the point content that gives them what they where looking for. In this part we will start dealing with this issue and help you through the process of figuring out how to balance between the users and the search engines needs. Keywords and when do they come into the picture? Keywords are the search terms users type in to search engines to find content that interests them. I want you to start being an active searcher and what I mean by that is I want you to save on the side all the keywords you searched for to have a better understanding of the keywords you use when you search for things on line. Although it's not going to be what everyone else searches for but it will give you a really good indicator to the complexity of searches. The first step even before starting to figure out the keywords that mater are figuring out how you interact with keywords. 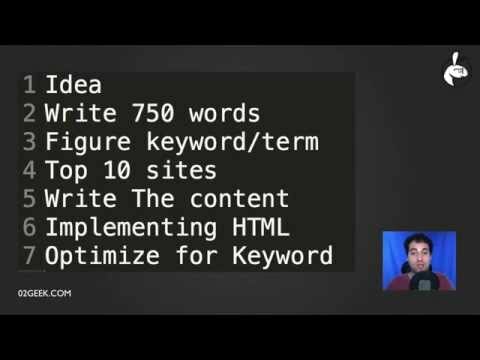 We will talk through and get you started thinking about keywords(in the next few courses we will get you to know how to work with keywords and how to select one keyword over another). While many courses echo a lot of fancy words we figured they don't really help anyone so instead our focus is on hands on practice. This course isn't going to be a dry copy paste course but a course that will challenge the way you think and hopefully by the end of it change the way you see and understand the web and search engines. To accomplish that we will start with creating a new project together a site called learnxmlnow.com we will understand what the product is, we will come up with the name of the domain and understand why we picked this domain, we will look at setting and configuring our hosting and domain and last but not least see how to upload our new site we got from our designer onto our site using FTP. That will end our part one but don't worry there is much more to follow as in the steps ahead we will learn the critical HTML tags for SEO, learn of the best tools to work with to monitor and improve your results, improve our copy, layout and configuration of our site, setup and improve our pages to get them up high on search engines, and much more. Search engines think like computers while users think like, well you guessed it, like humans. Although Google and other search engines work really hard on figuring out a way to tap into the human mind they still fall short at the power of how we actually think. I know many other resources will bloat to you how smart Search engines are but really they are dumb extremely dumb. As the years go by search engines are getting more complex to catch up with all the %u201Cbad apples%u201D that try to promote content that doesn't really make users happy. As search engines bloat so does there capability to really monitor content weakens as they have so many layers of %u201Cprotection%u201D that where added thorough the years to improve the results that users want. Search engines rely heavily on users and the good news is that you do as well. Instead of having a razor sharp focus on the search engine we can use the insight coming from search engines to understand what users really want. Our course will challenge the way you think about SEO even if you are an SEO expert. As every other 02geek course it comes with unlimited live support so you are never alone. Learning is not something that is done alone when ever you have a question we love hearing from you if through our commenting, email or live chat. So let's get started, good luck!